Home » 11-12 Offseason » Mets Spring Question 3: Where Does Justin Turner Fit? Mets Spring Question 3: Where Does Justin Turner Fit? With three days before pitchers and Molinas report to Port St. Lucie, let’s examine question #3 to be answered during Mets spring training: what will be Justin Turner‘s role? Last spring, Turner was the forgotten man in an open audition for the starting second baseman’s job. He was quickly written off and sent to AAA before Opening Day. After ten games in Buffalo, though, Turner joined the big club and eventually established himself as the everyday second baseman — save for June, when he moved over to the hot corner while David Wright was on the DL. Heading into this spring, however, second base is Daniel Murphy‘s job to lose; where does that leave Turner? Turner’s main value is versatility; he can play 2B adequately, but not spectacularly, so it’s unlikely he will be used as a late-inning defensive replacement for Murphy. His only chance of playing 3B again — at all — is if Wright is either injured or on another team. Turner can play shortstop capably enough in a pinch, but not well enough to consider him an occasional replacement for Ruben Tejada. Further complicating the issue is the presence of Ronny Cedeno, who makes Turner redundant. As a hitter, again, Turner is adequate but not spectacular; I’m not sure whether Terry Collins would look to him as a go-to guy in a pinch-hitting role. Turner’s running speed — like everything else in his repertoire — is good, not great, and therefore wouldn’t be considered the first guy off the bench to pinch-run. In short, Justin Turner is a solid, smart, hard-nosed, hustling ballplayer who does everything well enough to have value, but hasn’t displayed one specific skill that makes him valuable in a particular situation. He could be compared to Joe McEwing in that respect — jack of all trades, master of none. The only scenario I can see Turner being used is in late-inning double-switches, where perhaps he pinch-runs for Ike Davis, then goes to 2B while Murphy switches to 1B. But Cedeno can do that, so I’m not sure. Personally, I think Turner is right now the Mets’ best option for second base. But Murphy is being shoehorned there until further notice, and Cedeno might be next on the depth chart — assuming Tejada solidifies himself at short. Ah — therein lies Turner’s main opportunity to make the 25-man roster: Tejada not making it (be it due to injury or lack of performance), in which case Cedeno plays short and Turner is the utilityman. If he’s not playing second base and not the main utility infielder, Turner doesn’t quite fit into the Mets plans in any obvious capacity. Maybe he should learn to play the outfield, and/or first base, to extend his versatility. Of course, anything can happen in spring training, but as of now, it appears that Turner will have a tough time making the Mets Opening Day roster. What do you think? Does Turner fit in some way that I’m not seeing? Do you care one way or the other? Answer in the comments. Cedeno played SS regularly the last two years so to me seems like the safety value to Tejada until the rookies can get seasoning. He hasn’t played much 2nd base at all for years. Turner would be more logical as your back-up at 2nd, spelling Murphy a couple times a week. It’s important to have a real safety value there and Turner showed he could do it last season. It’s true that once the season begins, he might be the spare part, but it’s a good thing to have one in reserve. Starting can perhaps expose him, but Turner should find a spot on this team an can provide good bench support at 2B, 3B and pinch hitting. He also brings some needed energy. The way I see it, Turners role is to wait out the year and see what happens with Wright and Murphy. If Wright leaves or if Murphy cant survive, then Turner is in. If not, then they can trade him. One of the keys to understanding Turner’s value to the team is just that: value. He’s got experience, versatility at a cheap price. That’s what the Mets are all about. I wonder whether we’ve seen Justin’s offensive ceiling. Injured thumbs can seriously hurt a guy’s hitting. His low K totals give some hope for better batting averages, and slugging .516 in AAA in 2010 bespeaks more power than we saw last year. A full-time AAA job as an audition to replace someone else if they falter or are traded might not be a bad move. Stashing him on the bench and assuming he’ll never amount to more than a bench player seems like kind of a waste. Turner is one of Collins’ favorite ballplayers. When other players nursed their injuries, Turner continued to play, despite a balky thumb that compromised his legitimate gap power. Justin Turner is a clutch hitter and is a sound, if not spectacular ballplayer. Collins uses his bench players actively and Turner will see a lot of action on Terry’s roster. Turner is an invaluable insurance policy for 2nd & 3rd base, can play left & ss on demand and is a great late-inning option off the bench. 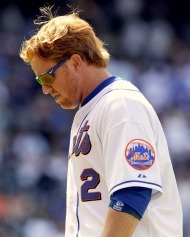 Justin Turner’s value to the 2012 NY Mets cannot be overestimated. He’s a key component. Considering plan A is now with the Florida Marlins, and plans B thru E are either: Tejada (SS) – Murph (2B) or Tejada (SS) – Cedeno (2B) or Cedeno (SS) – Murphy (2B) or Cedeno (SS) – Tejada (2B) I think it’s worth it for Turner to stick around as a plan F. It worked out for him last year and honestly, being good but not great is about as sure a bet as the Mets have going into this summer. trade him to Colorado for Eric Young jr.
Why? And where will he play? He’s a mediocre hitter, worse than Turner at 2B, and only a passable left fielder. His single tool is speed, but he can’t steal first base and it doesn’t help him much on defense, where he makes Angel Pagan look like a Gold Glover. Last year Turner was ticketed for Buffalo because he had an option year left. This year that doesn’t apply. If he doesn’t make the big league roster, the Mets will probably lose him on waivers. He might slide through late in the Spring when most teams’ rosters are set, but it seems like KC or Pittsburgh would want to jump on him, if he were available. The role for Turner is that he plays second and Murphy moves to third when David Wright gets traded. He probably starts the season on the bench with Cedeno in Buffalo. Everyone will pass Cedeno through waivers.